By the way this anvil might be worth $25 to maybe $50 depending on how desperate you are for an anvil but not near what the guy is asking for it. 25 for the anvil, another 20 for the hardy would be my best offer. I saw that one a while ago, and ignored it. At least it has a horn and a heel! :lol: It looks like casting defects under the face plate. 25 for the anvil, 10 for 30ft of rope and you will have an anchor. I guess I am just lucky. I have a vulcan anvil that I really appreciate. 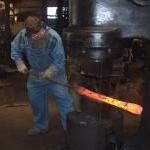 It has nice edges and allows me to do the forgings I desire. Here is a picture of Tsur and Brian making a three D horse head from square stock on it at the ABANA conference last time. I know it has a fairly soft surface but if you hit hot metal there is no problem. I have a better picture of the anvil I will post. Brian and I routinely strike on this anvil, and there have been a lot of students use it as well. Very nice anvil LDW, did you at least follow the link to the ebay auction? I'll try to rip a pic and post it here. Lyle's anvil was also easy to mount securely to the stand. The horn was also too flat, but that was an easy thing to fix with an angle grinder. We'll be taking it with us to New Hampshire this month then down to South Carolina to use as an anvil and striking anvil. I hope no one makes fun of us. I just bought a 100# Vulcan with a Champion hot cutter to fit about a month ago. $50.00 total. Guy was asking $100 but was tired of moving it anytime he wanted to use the bench so was glad it was going to someone that would use it. 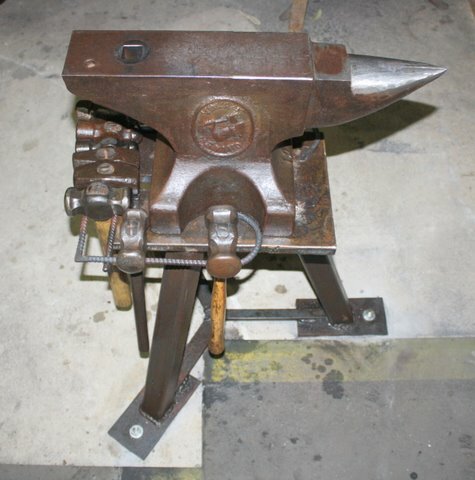 I will most likely have this one set up for students to use...will save my 'real' anvil face! Of course if someone wanted to purchase then I would sell it. Good clean edges all around. Haven't had time to clean it tho. Also, my first anvil was a 30-40#er, it is set aside for my 2 grandsons! I would say there is life left in it, but not $175 worth of life when there is so much better out there! It is, well it was, a 100#er....as big as that chunk is it just may weigh 95#s now! :P Just noticed that both sides are damaged!...so make that 85-90#s!! Thomas I saw the link, but the first post refers to vulcans as if all of them are the same. Which they may be, but I would buy a nice edged vulcan without any drawbacks. As I stated in the beginning of my first post, I may be lucky, but I like mine. Although I haven't used the big one yet I had no problems with the little one. Made some good easy $$ with that one! I took it with me to an art show that I got juried into and one of the requirement was, if choosen, you had to demonstrate your art form....and it was in a city library! Yea, I just worked with some small copper pieces on that anvil, also took a leg vise and my "Yesteryear" portable stump! The organizers said my work and demo got the most comments from the visitors! Where did you have that Vulcan hidden...I never saw it at Brian's. I not saying that each and every Vulcan is bad, that's like saying that each and every Fisher is a great anvil but I have seen more Vulcan anvils in failure mode than Fisher anvils. I have also seen Peter Wright, Hay Budden, Sodorfos, Trenton or any other brand you want to name with heavy damage but in my personal experience I have seen way more Vulcan anvils with greater amounts of damage than just about any other brand out there. Typically the face seems to be more brittle and so dose the cast iron that is used in them. The first anvil that I used at a community college was a Vulcan an it was always sending shards of the hard face flying, even when forging white hot metal, you didn't want to be forging on it when your metal was a dull red or even larger chunks of the face would be flying off. That's when I bought my first anvil and it only had half a hard face but had a solid wrought body. Years later I took a real risk on another cast iron anvil when I bought my 300# Fisher. I have had friends who bought Vulcan anvils and lost chunks of the face similar to the eBay anvil while doing routine forging operations. I don't think Vulcan had the best of quality control. If you have one that has survived intact then you have one of them that managed to get all of the right things that make a great anvil but from my perspective it is the exception rather than the rule for a Vulcan anvil. It is much more common to see a trashed Vulcan anvil than a good one. I shun them. better than nothing but not much. Hey Bentiron the name of this thread is "The Trouble with Vulcans"
I have only been blacksmithing for about 14 years, ya'll taught me a lot. I knew mine was softer than most, but it has held up well, even with me striking on it. I reworked the horn because it was so flat on top. If or when it fails I will get something different. I learn everyday, and appreciate everyones input. Hey Thomas, it was the anvil at the other forge in the shop. When you were at the treadle hammer it was on your right. Cast iron anvils will be more brittle because of the nature of Cast iron. having said that I had a friends 275 lb vulcan in my shop for about 4 years and it was heavily used mostly for sledge hammer striking and it held up beautifully. it had good edges and that sort of flat topped horn that they all had but it was a workhorse. So like was said before some are good some are bad. Take care and if you are lucky to get one that was right use it and enjoy it. Beware that they can be brittle and pay accordingly and all will be what it will be. Vulcan faces are generally fairly thin, they also have a know history of casting defects. Perhaps some of you have seen the vulcan I bring to Quad-State to display---ridge back, face worn totally through in places and the horn was broken off showing a set of casting flaws you could stick pencils in along the horn body interface. Not all of them have suffered abuse but I don't consider them a top tier brand like I do the Fisher. (Better than a HF ASO though!) I have owned several in my career but save for the one on my "Wall of Shame" I try to sell them on at a decent price as soon as possible. Now on the good side they are a quiet anvil and can be found fairly easily and so are good for beginners setting up in suburbia!